Textiles was also a great industry in ancient India. It was known that some of the finest cloth you could get anywhere in the world was from India. Textiles became one of the major commodities of trade between India and other countries. Cotton was also cultivated in India before anywhere else. From cotton came cloth through the development of the spinning wheel, another early contribution of India, and which dates back to over 5000 years. With textiles also came the art of making and the use of dyes and colors. We also find that textiles played an important part of the contributions and developments for which ancient India became known. In Our Oriental Heritage, Will Durant explains, Athe growing of cotton appears earlier in India than elsewhere; apparently it was used for cloth in Mohenjodaro. During the excavations at Mohenjodaro a small fragment of cotton fabric and a small piece of cotton string in the neck of a vessel were recovered. The quality of both fabric and the string leaves no doubt that a mature textile craft had existed in the Indus Valley civilization. Dr. Stanley Wolpert, professor of history at UCLA wrote in the publication India: AAncient Indians were the first humans to spin and weave cotton into cloth that continues to provide our most comfortable summer attire. How cotton finally spread to England can be described like this: It was in the 1st century when the Arab traders brought the fine muslin and calico from India and sold it to Italy and Spain. The Moors then introduced the cultivation of cotton into Spain in the 9th century. Fustians and Dimities were woven there in the 14th century, in Venice and Milan, at first with a linen warp. Little cotton cloth was imported to England before the 15th century, although small amounts were obtained chiefly for candlewicks. By the 17th century, the East India Company was bringing rare fabrics from India. Of course, cotton cannot become cloth unless there is a way to make the thread. And through a simple investigation we can find that the spinning wheel was one of India’s earliest contributions to the famous cloth that they were able to produce. Britannica’s Concise Encyclopedia relates: AThe spinning wheel is an early machine for turning textile fiber into thread or yarn, which was then woven into cloth on a loom. The spinning wheel was probably invented in India, though its origins are unclear. It reached Europe via the Middle East in the Middle Ages. Professor D. P. Singhal of the University of Queensland, Australia provides more clarity on this by writing in India and the World Civilization (page 176): A The spinning wheel is an Indian invention. To give more credence to this line of thought, in her book Spinning Wheels, Spinners and Spinning, Patricia Baines reports of written evidence to the presence of spinning wheels in Persia in 1257, and linguistic evidence that suggests they came to Persia from India. Therefore it is most likely that they were in operation much earlier than this. The significance of the spinning wheel is that it is one of the first examples of a belt-transmission of power. From the cultivation of cotton and the invention of the spinning wheel and the loom came some of the finest textiles the world has seen. India has been known for its brilliant and high quality cloth for hundreds of years. In History of India, Elphinstone writes: AThe beauty and delicacy of (Indian cotton cloth) was so long admired, and which, in fineness of texture, has never yet been approached in any country. Murray also writes therein: AIts fabrics, the most beautiful that human art has anywhere produced, were sought by merchants at the expense of the greatest toils and dangers. James Mill also writes in History of India: AOf the exquisite degree of perfection to which the Hindus have carried the production of the loom, it would be idle to offer any description; as there are few objects with which the inhabitants of Europe are better acquainted. Whatever may have been that attainment in this art of other nations of antiquity, the manufacturer of no modern nation can, in delicacy and fineness, vie with the textiles of Hindustan. The making of cloth goes back to ancient times in Bharatvarsha (India). It is even described in the Vedas how Sage Gritsmad made the first cloth from sowing cotton, then making thread with a wooden bobbin, and then cloth. Of course, India has been known for its beautiful textiles for many years. Making saris from silk, or with colored dyes, or embroidered with gold or silver thread, have made them into a desirable item in all parts of the world. Cotton was cultivated, then spun into threads and woven into cloth since ancient times in India, dating back at least 4000 to 5000 years ago. The Greeks did not know of cotton until Alexander invaded India where they found cotton for the first time. They had not found it in the previous countries through which they traveled, including Egypt, Mesopotamia or Persia. Previous to this, the Greeks had used only wool in their woven fabrics. From the findings at Mohendjodaro, a piece of cotton has been discovered that shows people at that time, 5000 years ago, were aware of the means to make and use it for clothing. Cotton was greatly cultivated in fields near Kashi (Varanasi) as well, which was an important center for textiles since the times of Lord Buddha. The skills of the spinners and weavers enabled them to make them extremely fine. In fact, Buddhist literature includes many references to the magnificent cotton spinners and weavers, relating that the fabrics were so fine that even oil could not penetrate the cloth. Many centers for the production of textiles existed. Kashmir was known for its woolen weaves and embroidery, places like Benares, Ujjain, Indore, and Paithan near Aurangabad, were known for their fine silks, as were places in the south like Kanchipuram. Rajasthan also specialized in all manner of patterned prints and dyed cloths, and also in carpet-making. Traders from ancient Greece, Egypt and Arabia ordered cotton cloth from India. They were especially known for the sheer quality of the cloth. When the French traveler and trader Tavernier visited India in the 17th century, he described the cotton clothes, by saying, AThey are so light and beautiful that you cannot even feel them with your hands, and the delicate embroidery is hardly visible. @ In another place he writes, AA Persian Ambassador went back from India and gifted a coconut to his Sultan. The courtiers were amazed at this petty gift. But more amazing was the fact that when the coconut was opened, a roll of 30 yards of [Dacca] mulmul [fabric] came out of it. In 1835 Edward Benz wrote, AThe Indians in every age have, in the textile industry, maintained an incomparable and matchless standard. Some of their mulmul clothes seem to have been made, not by humans but by fairies and butterflies. Further archeological evidence from Mohenjodaro shows that the knowledge of mordant dying was in existence from the second millennium BCE. And the use of block printing on textiles in India was known since 3000 BCE. Some historians view India as the original home of block printing. 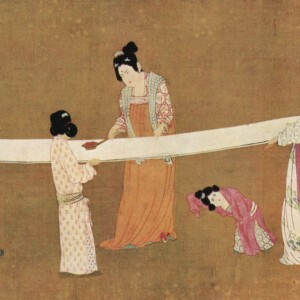 Stuart Robinson in his A History of Printed Textiles reports that the export of printed fabrics to China can be dated back to the fourth century BCE. They had been very much appreciated by the Chinese and even imitated by the Chinese craftsmen. Also at the Khmer capital of Angkor, Chou Ta-kuan, the Chinese observer, wrote at the end of the thirteenth century that the preference was given to Indian weaving for its skill and delicacy. Ancient Rome was known for having good trade relations with Bharatvarsha, ancient India. The chronicles of the Greek Periplus show that a variety of spices, good textiles (muslins and cottons), along with iron, gems and ivory were traded. Rome also supplied in return such things as cut gems, coral, perfumes, papyrus, copper, tin, and lead. Payments were generally in gold or silver coins at that time. The Roman writer Pliny (23-79 CE) mentioned that the costs of such things were quite high. He also wrote that, ANot a year passed in which India did not take fifty million sesterces away from Rome. The Greek geographer Strabo (63 BCEB20 CE) and the Periplus records also mention the Gujarat port of Barygaza (Broach) as a place that exported fine Indian textiles. The thirteenth century Chinese traveler Chau Ju-kua refers to Gujarat as a source of cotton fabrics of every color. Also Marco Polo recorded the exports of Indian textiles to China and South East Asia from the Masulipattinam (Andhra) and the Coromandel (Tamil) coasts in the largest ships in the thirteenth century. The old Tamil text Silappathikaarum (The Ankle Bracelet) from the late 2nd century CE, describes the wealth of some of the cities and maritime trading ports in southern India at that time. It relates that the markets offered a great variety of precious and prized commodities. The city of Puhar was populated with merchants and traders where there was a spacious forum for stored bales of merchandise, marked to show the quantity, weight and owner’s name. Even whole streets were specialized in particular commodities, such as coral, jewelry, pearls, sandalwood, gold, and other precious gems. Skilled craftsmen also brought finished items such as woven fabrics, silks, ivory carvings, jewelry and so on to be sold and later traded in far corners of the world. North India also had its centers for such trading as well, such as Taxila, Patilputra, and others. John Guy in his Arts of India, 1550-1900, mentions that in Broach had also been the discovery of a hoard of gold and silver coins mostly from the fourteenth century, belonging to the Mamluk kingdom of Egypt and Syria, which suggests the serious trading in exchange for precious metals. Even the rough fabrics were useful and became popular outside India. The early Indian sacks made of jute and hemp, used for packaging goods, were named after the Sanskrit word of Goni or Gonika, which became known as the A gunny sack in English. It is also reported that the attractiveness of fast-dyed, multi-colored Indian prints on cotton in Europe as one of the factors that lead to the formation of the London East India Company in 1600, followed by the Dutch and French counterparts thereafter. However, by the late 1600s, there was such overwhelming demand for Indian textiles, no matter whether from Bengal, Patna, or Surat, that ultimately the French and English wool and silk merchants prevailed on their governments to ban the importation of these imported cottons from India. The French ban came in 1686, while the English followed in 1701. Nonetheless, textile producing centers that catered to the internal or overland trade continued to prosper. Even today the uniqueness of India’s textiles, whether in shoulder bags, purses, saris, shawls, clothes, sheets, carpets, etc., remains high in global interest and of prized possession. 1. Niranjan Shah, India is the Original Home of Cotton, India Tribune, February 27, 2010. 3. Science and Technology in Ancient India, by Editorial Board of Vijnan Bharati, Mumbai, August, 2002, p.112, 4. 4. Prof. A. R. Vasudeva Murthy and Prasun Kumar Mishra, Indian Tradition of Chemistry and Chemical Technology, Samskrita Bharati, Bangalore, India, August, 1999, p. 48. 5. Kamlesh Kapur, Portraits of a Nation: History of India, Sterling Publishers, Private Limited, 2010, p. 416.